The City of Los Angeles (City) is proposing a project that would improve the existing water quality of dry-weather urban runoff and portion of wet-weather stormwater from the creeks prior to discharging back into Aliso Creek, Limekiln Creek and ultimately to the Los Angeles River. The proposed project would comply with Proposition O funding criteria while also providing multiple benefits to the neighborhood with improved, educational opportunities, wildlife habitats, and restoring vegetation. This project will also improve climate change adaptability, increase sustainability, replenish natural resources, and improve the community’s quality of life. The 11.8-acre project site is located in Council District 12 and the Northridge Community at 8956 Vanalden Avenue, east of Tampa and south of Nordhoff. The proposed project is comprised of three distinct construction sequences. The commencement of the following sequences may be overlapped and will not necessarily flow linearly. Sequence 1 – Clearing, Grubbing, Excavation, and Site Preparation: This sequence includes removal of existing site features including a small portion of concrete in Limekiln Creek Channel, clearing and grubbing, and excavation for pipes and bio retention areas and grading. At the end of this sequence, the site’s soil will be left in a stabilized, rough-graded finish. 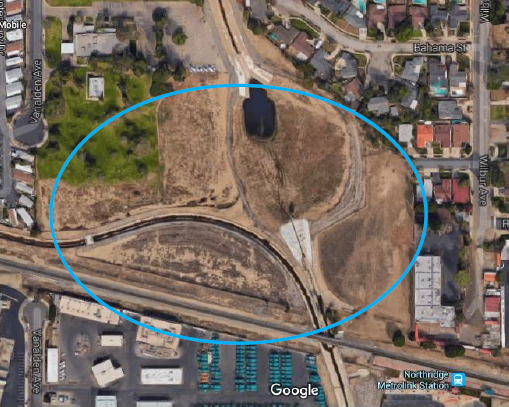 Sequence 2 – Stormwater Facilities: Sequence 2 of the proposed project construction would divert a portion of the flows from Aliso Creek, Limekiln Creek, and the existing 102-inch storm drain pipe to the site and construct and operate appropriate, beneficial, and feasible stormwater best management practices (BMPs) within the site to reduce pollutants entering the Los Angeles River. The BMPs include pretreatment devices and bioretention basins. Other stormwater facilities include diversions structures, pump stations, and on-site pipes along with associated electrical and instrumentation equipment. would include an improved pathway, aesthetic, and educational amenities that would further transform the project site to supplement the BMPs and associated water quality benefits. Plant material for the project will be native and drought-tolerant. Plant material that will be located in the new basins will be selected to be able to withstand ponding fluctuations and saturated soil conditions. A trail, included in Sequence 3, will expand the existing Vanalden Park. Previous What Is Your Neighborhood Council Doing Now? I am stepping down as NWNC President and am placing the council in the capable hands of Pamela Bolin, a long-time board member. 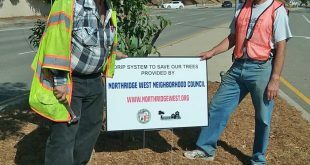 For the last two years, I’ve had the privilege of serving as President of Northridge West Neighborhood Council, and I’m grateful for the opportunity that you’ve given me.